A man who bought a stolen male French mastiff puppy helped bring him home Wednesday to be reunited with his owners and dog parents. Mesquite police are still investigating after two men were captured on surveillance video this week taking "Chipper" from behind the fence of a breeder's home. Bryan Vazquez said a man, who he is certain is the same person shown in the video, sold him the dog for $300 at the tire shop he works at in east Dallas. He said he suspected the dog was stolen and that's why he decided to buy it. Vazquez said he had no idea a search was underway for the dog until his wife saw the surveillance video posted online. Video of the snatching was widely distributed and picked up by news outlets. 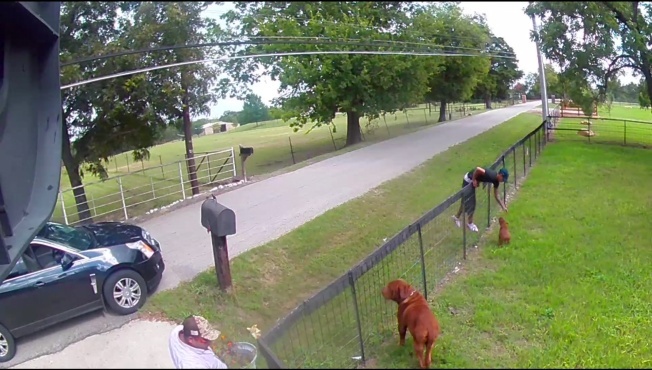 The dog's owner, Ivy Bordeaux, posted the video on social media, which shows two men approaching the fence. A man in a dark-colored shirt calls the puppy over, grabs it by the neck and lifts it up over the gate. The two men then drive off in a dark-colored SUV. Vazquez says he didn't hesitate to return "Chipper" when he learned the puppy was stolen. "It feels good to have returned the dog and to have everything for the dog to be back where it belongs," Vazquez said. On Wednesday night, Vazquez returned the dog to the breeder's home where it was stolen. The puppy was adopted Thursday to a family from Dripping Springs.